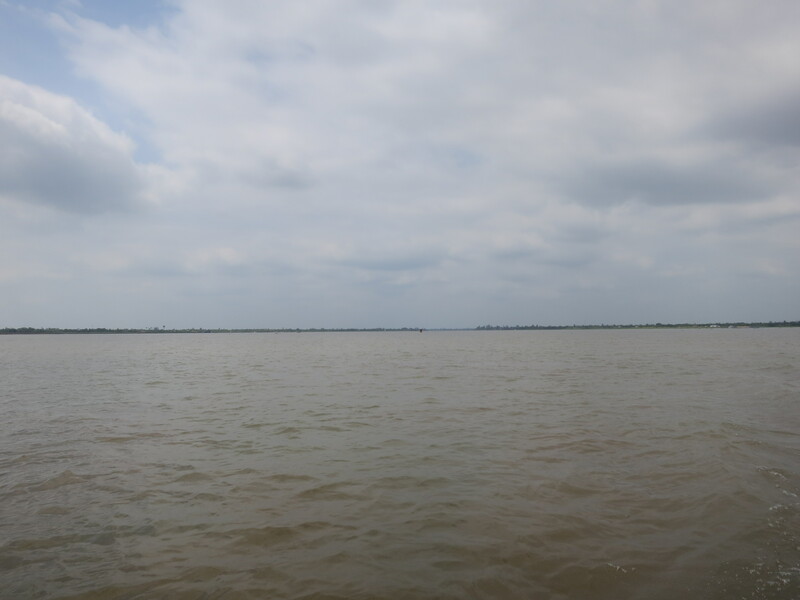 Yesterday going to the Ci Chu Tunnels I mentioned a couple of Swedes on the tour bus, guess what, today it was just me, Mattias and Elinor on the tour to the Mekong Delta ! Elinor is a film animator, Mattias and I share an affinity for electrical pylons, turns out he builds them as well. Not too busy in the darkness of a Swedish Winter so here they are, enjoying the warmth. 8.00 am came round and we promptly departed. It’s quite a drive to the Delta, about 95 miles, with the traffic and scooters this is about a two and a half hour drive. 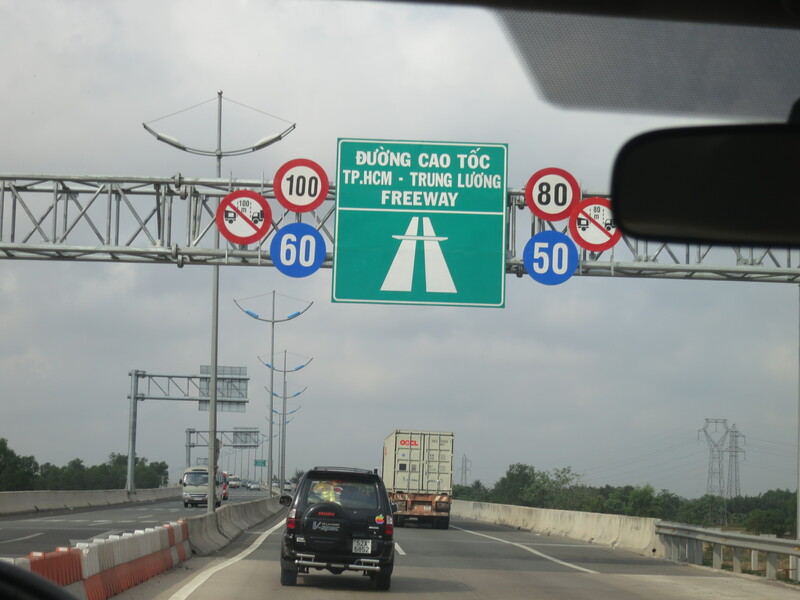 Most of the distance is covered by the Ho Chi Minh Freeway (no kidding), the locals are quite proud of it as it has a central reservation. Head ons have been seriously reduced since its introduction I am happy to relate. The first view of the river as we drew into the parking area was stupendous, just as I had imagined, only better. Hugely wide, just over a mile, alive with watercraft of every description chugging, steaming, speeding or just moored. Our guide, San, had filled us with some trepidation with instructions on moving slowly so as not to capsize, to check the life jackets, and such so we were expecting some sort of canoe. 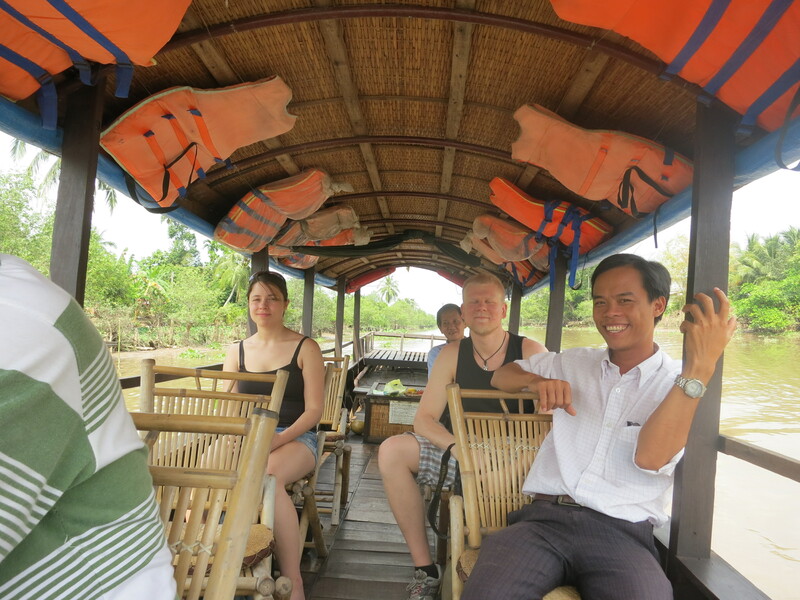 No, not really, the three of us made our way onto a rather large Sampan with chairs, driver and a roof. We chose to sit in a heap on the stern platform, the sun came out, my kind Swedish friends shared their sunscreen and we were off into the stream. Our first stop was to see the floating market where the local farmers bring their produce to sell or trade. Quite interesting but apparently much busier at dawn. 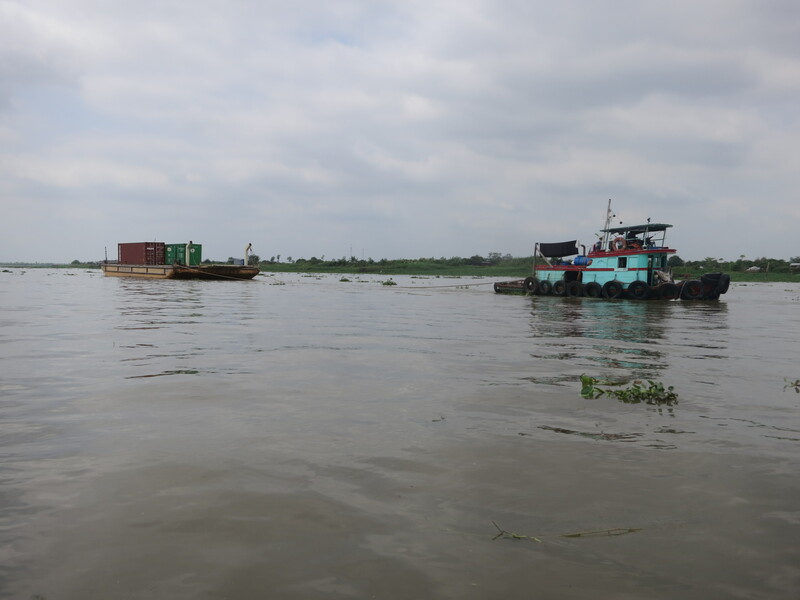 Then we were off on a long stretch across the river to a narrow tributary which we gained after running aground once due to the receding tide. We paused to tour a sweet (candy) factory, Mattias and I muttered comments about child sweatshops and we tried to look interested. After some assurances that this was a family run business and that the young children were part of the family we thawed somewhat and began to pay attention. 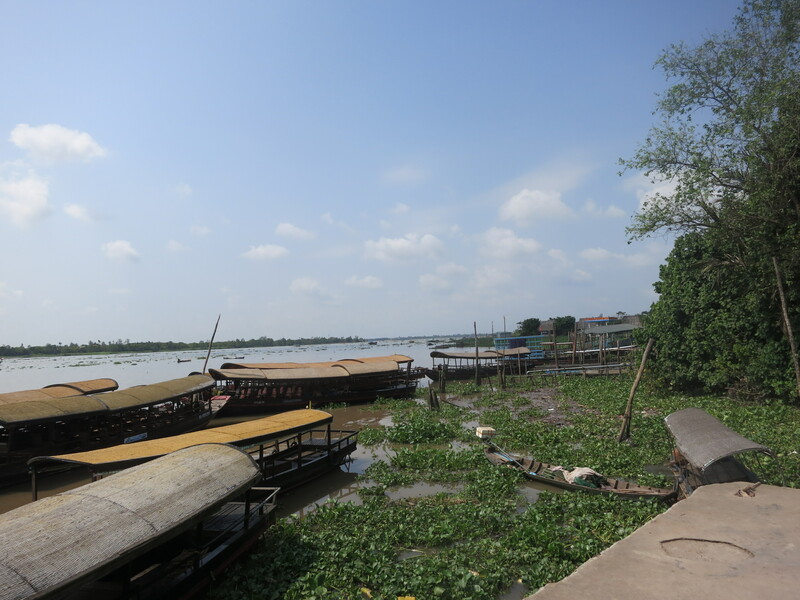 One of the main trade goods on the river is rice husks, these are used to provide heat for cooking. So we watched what we assumed was the manufacture of pop rice (think popcorn) which was then flavored with strawberry flavoring. It tasted ok, far too sweet for my taste but I see the appeal. 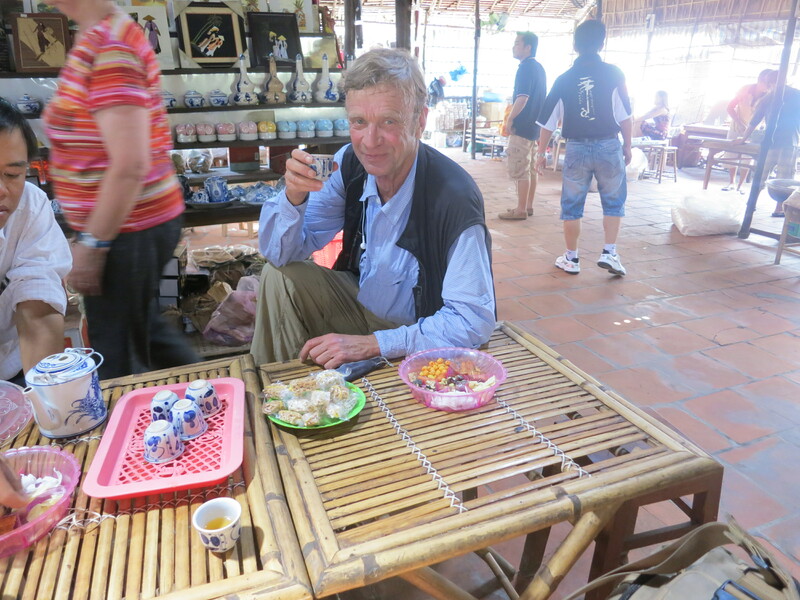 Tea was served and local delicacies offered, the local ginger was tasty but I fell for the Lotus seeds and even bought a packet. It apparently is a sleep aid and how I need that. 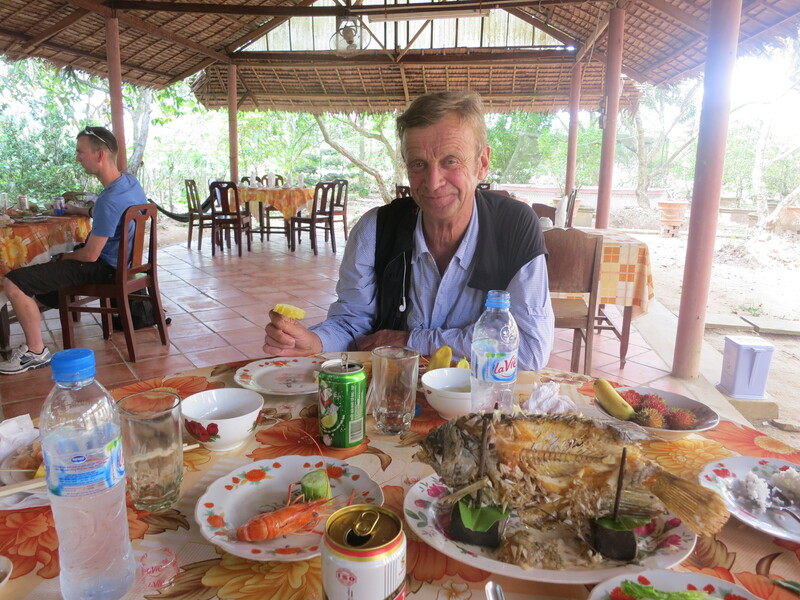 Lunch followed at a great looking old French Colonial house with a huge back garden converted into an open air restaurant, a highly surprising destination in a narrow spur of the Delta. Elephant fish in rice paper with salad was followed by king prawns, then rice and unidentified meat, pot stickers, all deliciously fresh. We three were pleasantly surprised. Further up what could be called the bayou we paused for a short music recital by local musicians on local instruments. I was somewhat put off as we arrived as the previous group was leaving, to the strains of Auld Lang Syne! The race is on at high tide, heading for the open sea, South China that is. Fantastic. 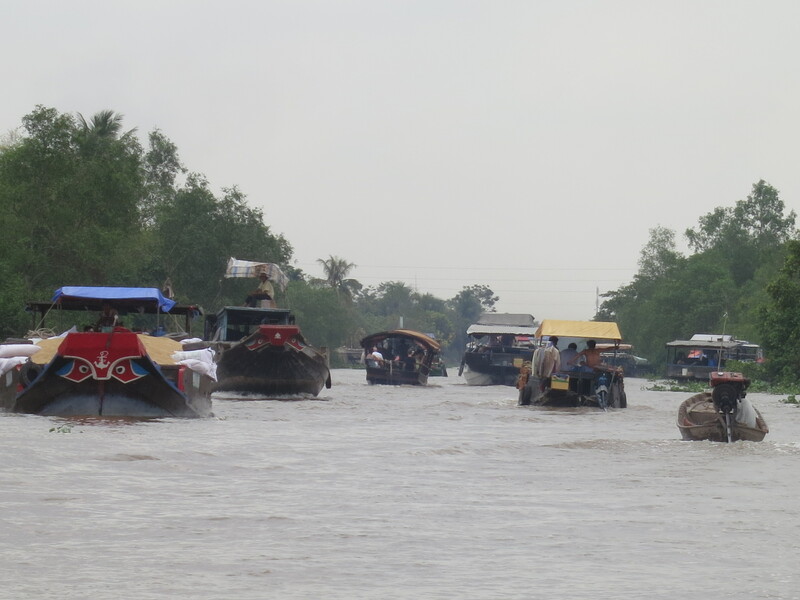 Then it was off again and turning a corner we found ourselves in the main stream, packed with boats all heading downstream on the rising tide. I was in boat heaven ! Following that, we went to a brick factory, yes a brick factory. It was quite interesting tho Mattias and I muttered sweat shops again. It is a massive operation with enormous kilns baking hundreds of thousands of bricks at a time. 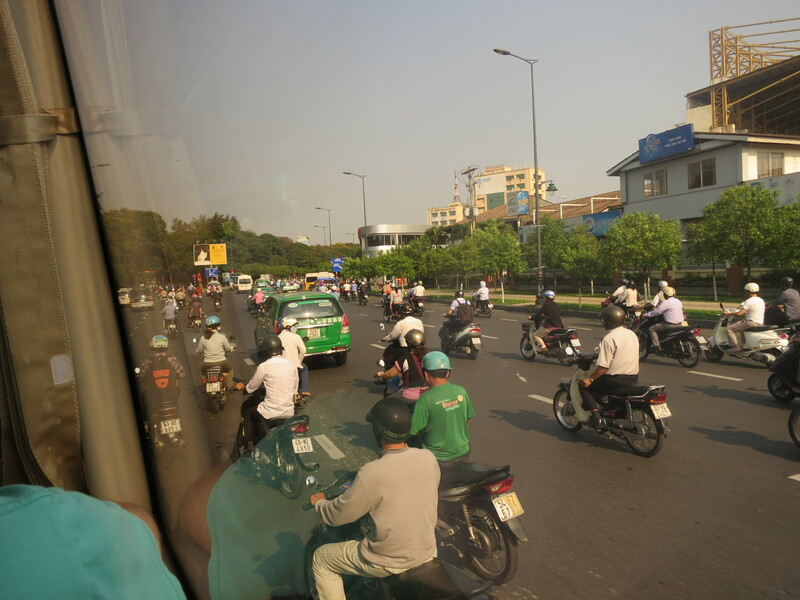 Then it was over and we came back to HCMC through the rush hour, a three hour drive. All in all a great day on the river and I wish there was an easy way to share photos instantly using the iPad. I will keep looking and will try and endure the glares in business centers. To Hanoi in the morning. See you there. Bye bye scooterland, oh, and correction, there are 8 million people in HCMC and five million scooters, there are half a million cars. Enough said. 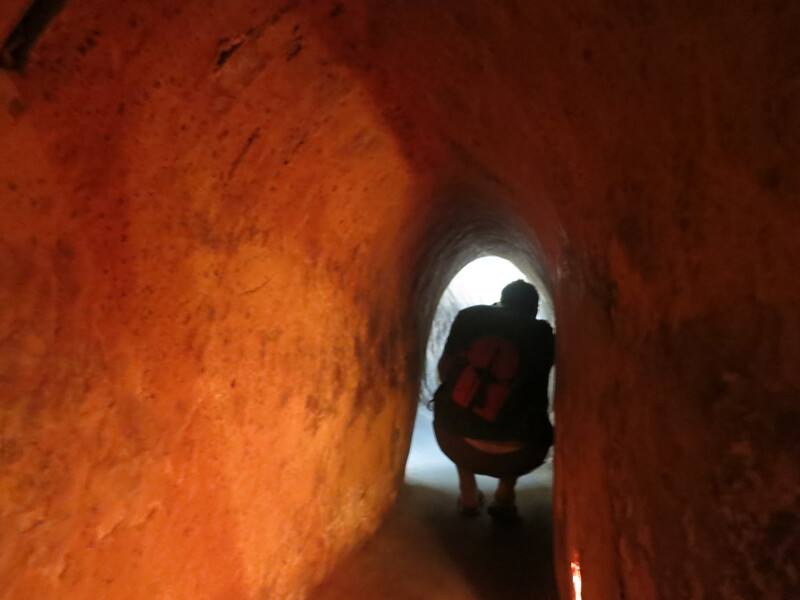 Early morning decision made to go to the Cu Chi Tunnels. This 150 square mile complex built originally by the local residents to hide from the French was started in 1948. 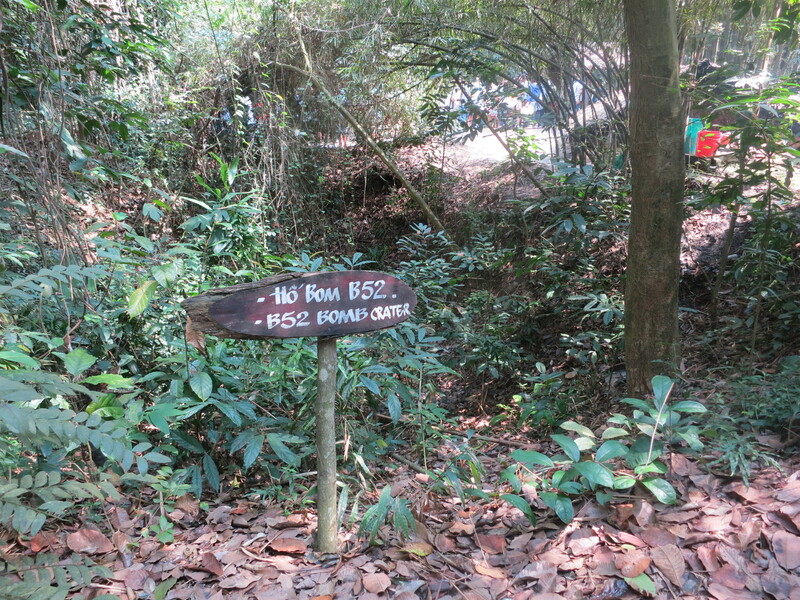 With the arrival of the American forces in 1965 the complex was adopted by the Viet Kong who reinforced the tunnels and built two further deeper levels. These deeper tunnels provided protection from the bombs dropped by the B52s. I was wrong about them extending to the Lautian border, it is the Cambodian. What’s great here is the opportunity to be spontaneous, I made the decision to take the tour at 6.00am and by 8.00 I was on the bus. A few Aussies, couple of Swedes, one American and half a dozen Brits. The Saigon Tourist bus was air-conditioned and the tour guide Phuong was extremely knowledgeable and, to give him extra credit, delightfully coherent. 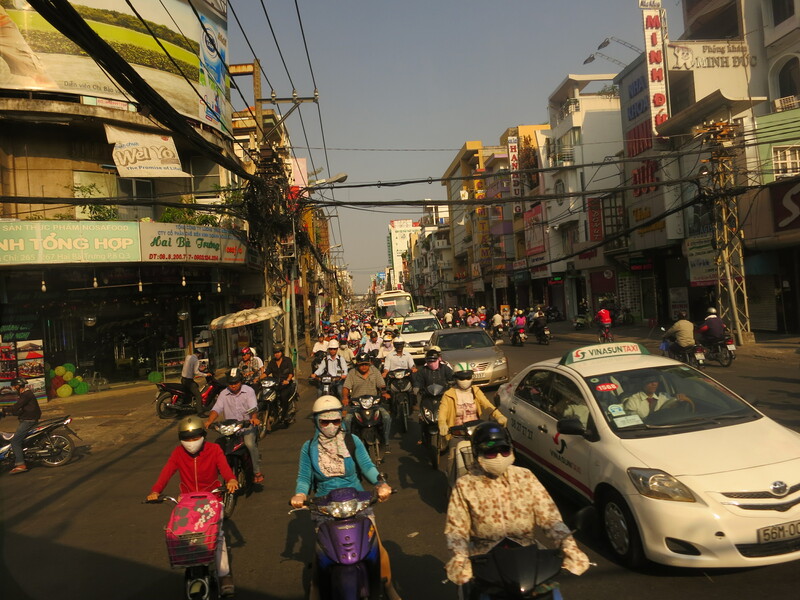 We chugged out of Saigon through the swarming motor scooters and for probably the first ten miles averaged probably 10 MPH. Then we were out in the countryside and I saw my first field since arriving. Not sure what was growing but sure was good to see green again. The drive is an hour and a half total so we were at the gate by 10.00 am, thankfully before it got too hot. Comments going forward could be fraught, but, I was there, so here goes. They do say I believe that “The victor gets to write the history” and to be honest this tiny nation, admittedly with outside help, booted the good ol’ United States back home. The introductory movie I have seen critiqued on Trip Advisor as blatant propaganda, hmm, ever seen a movie about how the US won World War Two ? 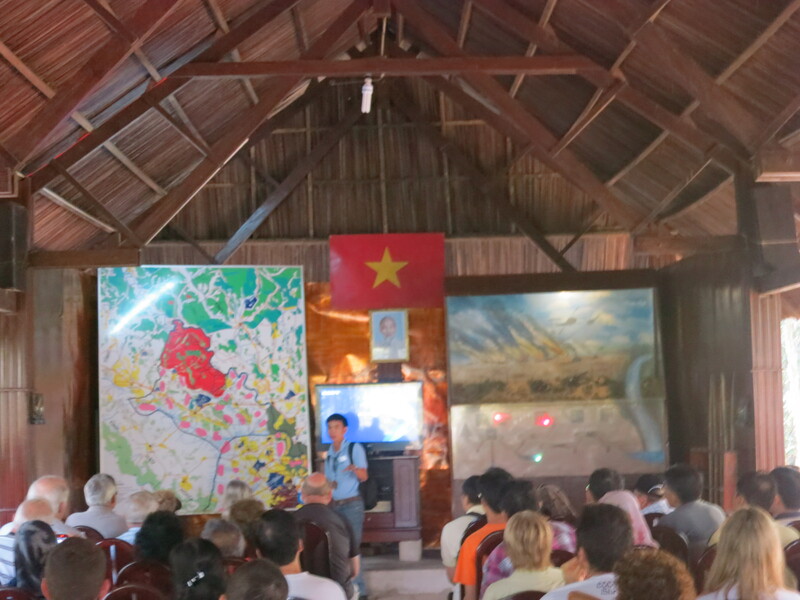 No, it wasn’t propaganda, just a straightforward description of what went on in the District of Cu Chi between 1965 and 1975. I have been fortunate enough, if you can say that, to have visited the sites of the Trench Battles of WW1, the Beaches of Normandy, Colloden, even the site of Valley Forge and frankly, Cu Chi is and deserves to be right there with those monumental memorials. So, enough pontificating from me and thanks to my Sister for applying the necessary pressure last night when I was vacillating. 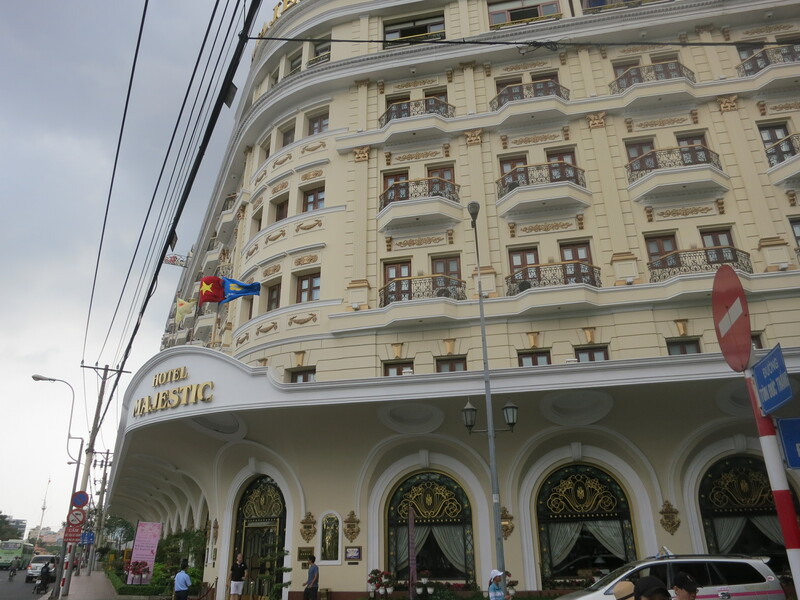 On a lighter note: I did go to the Majestic Hotel for tea and inhaled the atmosphere imaging what it must have been like back in the day. The grand old hotel is full of charm and auld worldliness, though how it will cope with the 30 odd storey annexe remains to be seen. Tomorrow I am off to the Mekong Delta, more after that.